This black teardrop wreath is covered in polka dot burlap ribbon, striped ribbon, spider ribbon, green striped deco mesh and orange striped deco mesh. In the center hangs a wooden “Happy Halloween” sign surrounded by orange jack o lanterns, spiders and webs. A green web with a black spider sits at the top. Green and purple ornament balls finish off this adorable wreath! 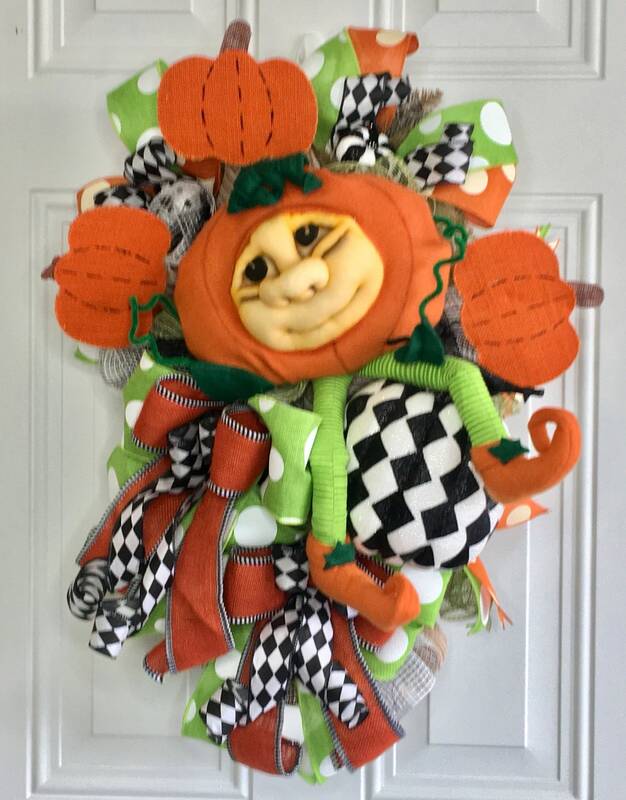 Great your guests with this fun adorable character pumpkin Wreath/Swag This hand sewn pumpkin was created by Embe Inspirations. The harlequin, black and white will make this one stand out on your front door. It Measures approx 26” x 24”.